It's a new month, so it's time to delve into the jewelry collection of a new royal lady! Our Magpie of the Month for February is Princess Marie of Denmark, who celebrates her birthday today. We're kicking things off with a look at her wedding jewels. 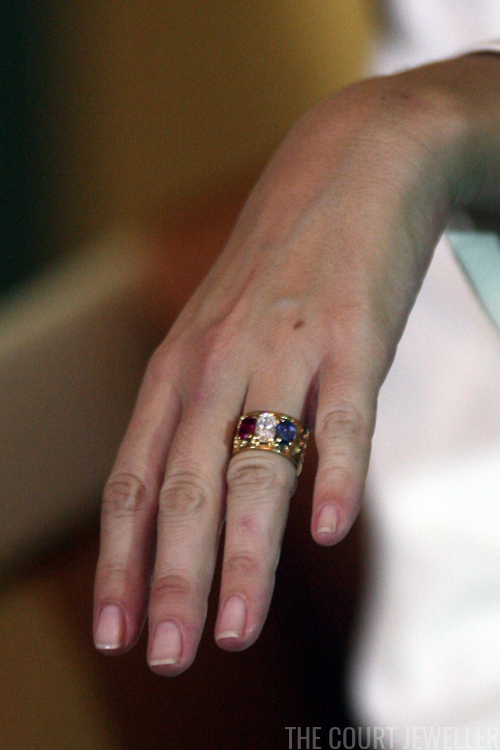 Before we talk bridal tiaras, we have to look at Marie's unusual engagement rings. I don't think I'm exaggerating when I say that this is perhaps the most controversial royal engagement ring of all time, at least style-wise. The gold ring is set with a trio of stones: a ruby, a diamond, and a sapphire. 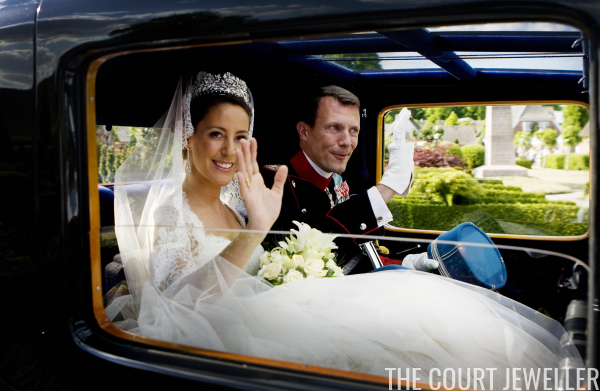 The gems mimic the French flag, a nod from Prince Joachim (who is half French himself) to Marie's French roots. On her wedding day, Marie wore her engagement ring on her right hand, making way for her new gold wedding band on her left. Marie paired the tiara with a pair of dramatic diamond earrings. The delicate design of the earrings echoed some of the lace patterns in Marie's gown and veil. How do you rate Marie's wedding jewels?